If you are delivering a presentation and get feedback, ideas, projects to do, and so on, you can immediately enter them into your presentation using the Speaker Notes feature. Since the Meeting Minder was eliminated in PowerPoint 2003, Speaker Notes is the only way to add to your presentation in Slide Show view. While in Slide Show view, right-click and choose Screen > Speaker Notes. Type your content and click Close. The text is immediately saved in the Notes pane of the current slide. 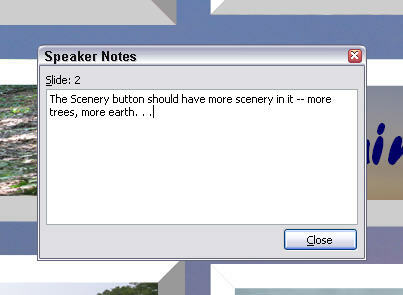 However, Speaker Notes were removed in PowerPoint 2007. See the first tip below for a technique you can use.